AUCKLAND, New Zealand - "Tough". That's how Navy Blues midfielder Reid Drake described Auckland City FC's 2-0 win over the Solomon Warriors yesterday. 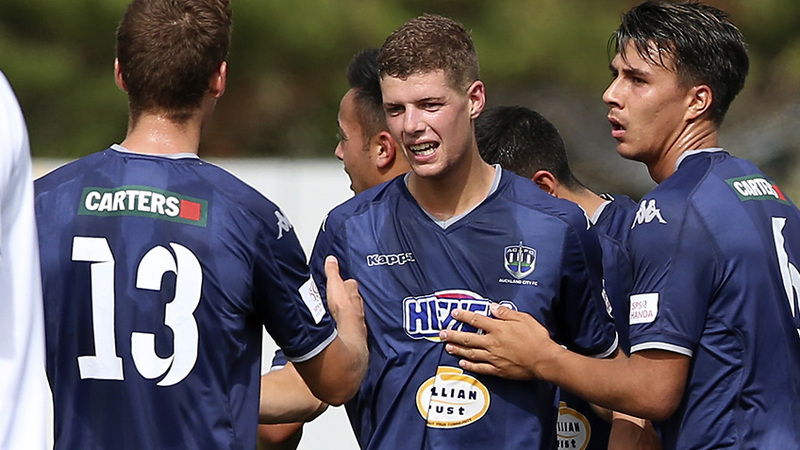 Drake made his fourth start in the OFC Champions League this season and put in a tough shift in midfield alongside Cam Howieson and Cole Peverley as the Navy Blues won through to set-up a mouthwatering rematch with rivals Team Wellington. "The Solomon Warriors are a very good team and today was a tough game for us but we dealt with most of their threats very well. "We focused on doing our thing with the ball and recycling possession. Our two goals showed that our patience and perserverance were rewarded. Solomon Warriors had two gilt-edged chances to score and break Auckland City FC's remarkable clean sheet sequence, the first when Kensi Tangis was denied in a one-on-one challenge by Enaut Zubikarai, the second again from the Spanish goalkeeper following a beautiful rasping drive by midfielder John Alick. Drake said he was unsurprised how skilful the Warriors line-up was and reserved special praise for Zubikarai and his team-mates as they kept their opponents goalless for the 10th consecutive OFC Champions League match in a row, some 953 minutes without conceding, including 53 minutes of the 2-1 win over Western United in March 2017. "The Warriors are a very skilful team and because they're also very quick they played through our lines once or twice and had a couple of very good chances. "Zubikarai pulled off some very good saves but we also showed our commitment to our defence with three or four players always trying to block shots or shut opponents down. "We're prepared to put our bodies on the line to put in solid defensive work," he said. Across all competitions, Auckland City FC have accumulated 1,260 minutes without conceding a goal in 14 matches in the ISPS Handa Premiership and OFC Champions League and Drake's brother Danyon played a key role in that run when he replaced Zubikarai in the 11-0 win over Malampa Revivors last season. Danyon's shoulder injury at the FIFA Club World Cup saw him enter an intensive rehabilitation programme but Reid says his sibling is doing well. But fitness is also key for Reid now he's regularly starting matches in the Navy Blues chase for Oceania title number 10. "Danyon is coming along nicely in his recovery. He's almost three months in so he's got another three months in front of him before he starts playing again and he's back into his program today - its great to see him progressing well. "The fitness levels are difficult to build when you come straight into the team and play 90 minutes especiallty for players who perhaps haven't had as much game time in the first part of the season. "We have had a few midweek practice games throughout the lead-in to the OFC Champions League group stage and knock-out phase. We know these matches are on the horizon so its up to each player to take responsibility for their fitness and make sure they're ready to go when called upon. "We put a lot of hard work into training as a team but there will always be a little bit of match fitness missing but if you do the work you'll be ready," he said. It was also their 23rd consecutive match in the OFC Champions League without defeat, just four matches short of equalling the competition record they set between 28 March 2008 and 31 March 2012. Auckland City FC's current sequence dates back to 3 May 2014 when AS Pirae defeated the Navy Blues 2-1 in the semi-final, 2nd Leg, clash at Stade Pater, Tahiti. The run has lasted 3 years, 11 months and 11 days (1,442 days total) to April 9, 2018. The Navy Blues face Team Wellington in the OFC Champions League semi-final, first leg, at David Farrington Park on the weekend of 21-22 April, 2018. The exact match date and kick-off time is yet to be decided for both legs.